I am the head of Environmental Defense Fund's (EDF) national Energy Program and the Regional Director of our Texas Office. Dynegy, a Texas-based energy giant, is pulling out all the stops in Illinois to keep uneconomic and dirty coal plants running. Dynegy is Illinois’ largest producer of coal-fired electricity, but the falling prices of other power sources, including renewable energy, have hurt the company’s bottom line. Last year, Dynegy tried to ramrod customer-funded coal subsidies into the Future Energy Jobs Act at the last minute, but Environmental Defense Fund (EDF) and our allies successfully blocked that effort. But, like the Hydra of Greek mythology, when we cut off one head, more appeared. The legendary Dynegyhasn’t given up on its quest for a coal bailout, and the company is tapping nearly every avenue of government along the way. 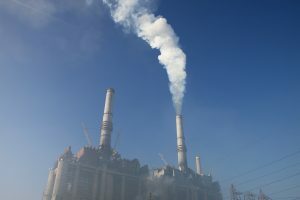 For almost a year, Dynegy worked with the Illinois Environmental Protection Agency (EPA) to re-write pollution standards so that the company can run its dirtier plants more often, earning bigger profits and keeping those coal plants afloat. The current rules, negotiated 10 years ago, placed limits on emissions from certain power plants. The proposed rule change would aggregate emissions – an important change that would allow Dynegy to calculate its emissions relative to its entire fleet and permit double the greenhouse gas pollution the corporation emitted last year. The rule is now pending before the Illinois Pollution Control Board, which is accepting public comments and will hear expert testimony in early 2018. Less than a month after the rule changes were proposed, a group of Illinois House representatives introduced a bill that would provide Dynegy with a customer-funded bailout. EDF estimates the legislation would raise rates on Central and Southern Illinois residents by more than $400 million per year. Rather than have Dynegy retire its most polluting, least profitable power plants, the proposed law would force customers to pay to keep the plants open. EDF estimates the legislation would raise rates on Central and Southern Illinois residents by more than $400 million per year. That staggering request raises even more eyebrows given that, days after the legislation was filed, Vistra Energy, another Texas power giant, announced it was merging with Dynegy and creating over $5 billion in excess capital. Lawmakers heard testimony about the proposal last Tuesday. EDF and other environmental and consumer advocates, along with the Illinois Attorney General’s Office, criticized the proposal and pointed to evidence showing the harm it would cause to the state. The ICC obliged the Governor with a report that finds there is a projected surplus of electricity in Dynegy’s region and grid reliability is sound. Although ensuring reliability is the responsibility of the regional grid operator, and not the state’s regulatory agency, the ICC obliged the Governor with a report that finds there is a projected surplus of electricity in Dynegy’s region and grid reliability is sound. In other words, it’s unlikely that a world without Dynegy’s coal plants would result in any loss of power because the grid is able to make more electricity than we’ll likely need. At the same time, the report proposes a number of policy options the state could take in response to the Governor’s concerns. Such options range from allowing the current competitive market to function as normal (a healthy option) to requiring long-term contracts for coal generation to guarantee profits for coal plants (aka bailouts). A stakeholder process to discuss whether there is a need to take action will likely begin this month. The pro-coal push is hardly unique to Illinois. Around the country, natural gas and renewable power sources are driving expensive coal out of the competitive market. Simultaneously, a number of factors – including increasingly more efficient lighting and appliances – have caused energy consumption to plateau and even decrease in some areas. Meanwhile, job growth in clean energy (wind, solar, and energy efficiency) far outpacescoal jobs – more than three-to-one. Job growth in clean energy (wind, solar, and energy efficiency) far outpaces coal jobs – more than three-to-one. Given all of this, it is no surprise that coal generators are seeking relief anywhere they can find it. Energy Secretary Rick Perry is even proposing bailouts at the federal level, which would prop up expensive, aging coal plants like Dynegy’s. The reality is that none of Big Coal’s efforts can reverse the rising tide, and Illinois should continue its march to a clean energy future – not bail out the energy source of the past. Thank Jim for the Post! Concerns about cleanup and competition from cheaper natural gas will result in the closure of a plant that has been an economic cornerstone of the Navajo community for decades.